Pets Costs > How Much Does a Bird Feeder Cost? 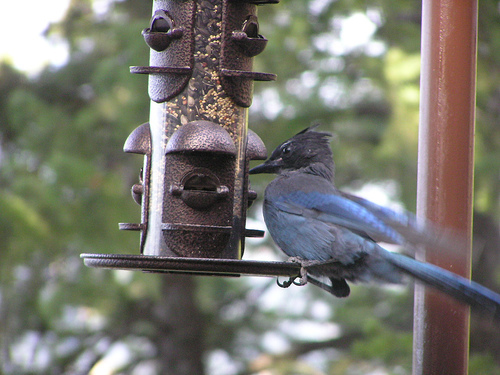 Purchasing a bird feeder is the best way to attract beautiful birds to your yard. Some bird feeders rest just off the ground, others sit atop a pole, and others are hung from a tree branch. Some bird feeders are specifically designed to attract hummingbirds, blue birds, or wild birds. Which one you choose depends on which types of birds you wish to see. On average, the cost of a bird feeder will depend on the type of feeder you want, the brand and where you purchase it from. Costs can range anywhere from as little as $5 to more than $100. Check out the table below to see what popular brands and types of feeders will cost. A screen bird feeder, one that rests just off the ground, can cost anywhere from $30-$90 depending on the intricacies of the design. A raised bird feeder costs $20-$75 and also depends on the design. Hanging feeders, usually designed to attract hummingbirds or bluebirds, can cost as little as $12 or as much as $65. A squirrel proof bird feeder that prevents squirrels from accessing the bird seed inside can cost anywhere from $19 to $100. A bird feeder that attaches to the window can cost anywhere from $4 to $48. For example, the Perky-Pet 348 Window Wild Bird Feeder retails for $7 to $14. A bungee based feeder that can hang from a tree and swing around from side to side can cost anywhere from $6 to $30. A popular product such as the Brome 1024 Squirrel Buster Plus retails for $52 to $100. This feeder has over 6 feed stations, a powder-coated aluminum and closed seed ports to deter the squirrels from accessing it. These are feeders that will be close to the ground and are ideal for nuts, insects or seeds. These bird feeders are ideal for those who want to attract birds that eat near ground levels such as morning doves and sparrows. These feeders will be covered but will have clear sides so you’re able to see the seed level. As the seeds fall, it will land along a tray on the bottom of the feeder. Along the bottom will be perches where birds, such as cardinals, woodpeckers, and chickadees, can land on. A nectar feeder will have special ports designed to hold sugar-rich liquids. This can either be done using a premade mix or simply with water and sugar. These feeders will attract orioles and hummingbirds. A platform feeder will have an open design so they can watch out for predators as they eat. Platform feeders, depending on the size, may allow multiple birds, including larger birds, to feed at once. A platform feeder won’t have a roof, so if it rains or snows, the platform will have to be cleaned often. A suet feed will be designed for birds that tend to cling to trees such as woodpeckers and wrens. These feeders won’t have a perch, but instead, it will resemble a small cage, which is designed to hold a suet block you can purchase at the local store. A tube feeder is shaped as a cylinder and will have tiny seed ports that dispense a bit of seed at a time. Most tubes will have six to eight perches, allowing multiple birds, such as chickadees and finches, to land on the perches. These perches are often small and won’t attract larger birds. If you wish to continue enjoying the birds in your yard, you must purchase more seed or nectar to fill your bird feeder anytime it becomes empty. The cost of bird food will depend on the type of food you’re looking to purchase. Thistle can cost $1 per pound, while mixed bird seed can cost $10 to $40 per bag. Some raised bird feeders do not come with the pole on which you install them. This must then be purchased or built separately. Poles can start at $15, and the kits will include all the necessary tools in order to install them properly. Hand-crafted bird feeders, such as the kind you may see at a craft show, can cost anywhere from $100 to $500. With these bird feeders, you are paying more for design than function. Take a look at the type of birds that you’re going to want to feed. Different types of birds are going to use different types of feeders. Large feeders are going to attract your larger birds, while smaller feeders will attract birds such as chickadees. For example, sparrows and doves tend to feed on the ground or platform and won’t do well on a suet block feeder. Research the bird food that can go in the feeder. There are many specific types of foods but what you’ll find out is that some food can’t fit through some holes on certain feeders. The size of the feeder will play a larger role because this will dictate how much food the feeder can actually hold. The more food the feeder can hold, the less you’ll have to refill it over time. Take a look at how easy the bird feeder is in terms of refilling it, how it hangs and how it can be cleaned. Consider a feeder that is easy to take apart and refill. For those who live in colder climates, consider getting material that is sustainable to harsher climates such as sleet and snow. Cheaper plastics can wear and chip away a lot faster. Start with a simple feed and feeder to learn how to attract birds. This will give you a good idea of what kind of birds flock around your home. One way to save money is to buy birdseed in bulk. The more you buy at a time, the cheaper it will be per unit. There are many kinds of bird feeders that can be easily made at home rather than purchasing one. Before shopping for a bird feeder, decide what is more important to you: design or function. Determine whether or not you are capable of making your own rather than purchasing one. Look for deals on bird feeders in stores. The best time to find a great deal is in the spring.